Yellow Nelumbo. Sacred Bean. Water Chinquepin. (Plate Iv.). Nelumbo lutea. Middle states, west and south. Flowers: one to five inches in diameter; growing singly on long, naked scapes. Calyx and Corolla: appear like those of the white water-lily. Stamens: numerous. Pistils: numerous and hidden in a concave receptacle. 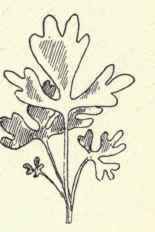 Leaves: twenty inches in diameter; growing well out of the water, or floating; peltate; veined. Rootstock: thick; tuberous. Of all the family the nelumbo has the most interesting and careful manner of growing its fruit. Evidently it has determined upon giving the seeds every advantage. The receptacle is enlarged into a flat, top-shaped body, in which the pistils are systematically sunken. Here the ovaries grow into one-seeded nuts that are about the size of chinquepins. They and the tubers are quite edible. The flowers of the native plant are always pale yellow. The gorgeous, showy,pink and white variety is the introduced plant and the one that should properly be called sacred bean. It is this flower that the old Egyptians dedicated to Osiris, the god of life and light, and it was from the shape of its seed vessels that they originated cornucopias. The seeds were sown by enclosing them first in clay and then throwing them in the river. 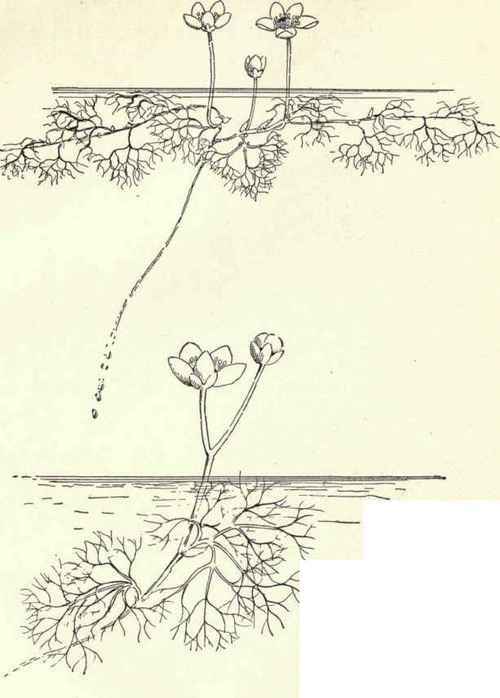 Many believe from this custom that it is the nelumbo that is alluded to in Ecclesiastes xi. I: "Cast thy bread upon the water: for thou shalt find it after many days." prev: Yellow Pond-Lily. Spatter Dock. (Plate III.). Nymphaea advena.